Hybrid .... Combination of an ABS cover skin with a rear steel door panel. Offers a secure door with an outer insulated easy clean cover. Its brilliant and cost effective!! To see more detail and some samples please select the type of door on the sub menu. We are happy to visit your home to discuss any of the options available to you, we will then be able to provide a tailored quote to meet your needs with no obligation! Canopy doors are a one piece panel door in Steel, GRP or Timber. For added security steel is the preferred material. Most new doors include an outer frame ensuring the integrity of the door. Canopy doors can be motorised using a bow-arm device but we recommend you use a retractable panel door where no bow-arm is required. There are a number of pattern designs to choose from. 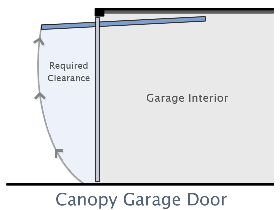 The name canopy comes from its final opening position the lower part of the door extends past the door line forming a small canopy! Retractable garage doors are a one piece panel in Steel, GRP or Timber. Steel is a recommended material due to its strength and increases security to your garage. Retractable doors are a track which hangs from your garage roof rafts and at the top inside has rollers which are connected to the top of the door and when the door opens the rollers travel along the door tracks. This retractable door design makes it very easy to have a motor fitted making life easier to open the door from a hand held remote control and there are a number of pattern designs to choose from.